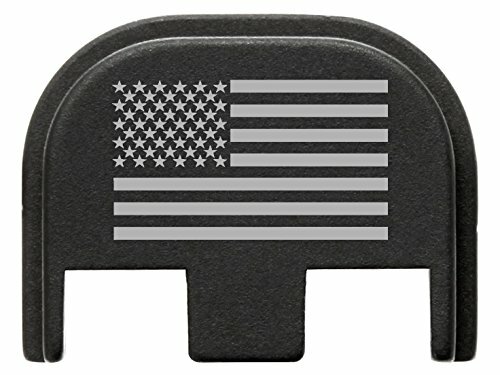 Fixxxer Gen 5 Rear Cover Plate Glock (American Flag design) Fits Most Models (Not G42, G43) Fits Gen 5 Only by Fixxxer at Practical Tactical Podcast. MPN: FXR602. Hurry! Limited time offer. Offer valid only while supplies last. Fixxxer slide back plates are made of T6 aluminum, hard coat anodized. Great replacement for a plastic factory part. All designs are laser engraved. Fixxxer slide back plates are made of T6 aluminum, hard coat anodized. Great replacement for a plastic factory part. All designs are laser engraved. Black anodized and permanent laser engraved slide cover plates are made from durable aluminum. Slide cover plates fit all Glock models and are easily installed. You will appreciate the quality of FIXXXER products. We also do Custom Plates! Fits all Gen 5 Only. Note: does not fit 42 and 43. Fixxxer LLC is proud to be an American Company. We stand behind our products, period. Disclaimer - "GLOCK" is a federally registered trademark of Glock, Inc. or Glock Ges.m.b.H. Fixxxer LLC has NO affiliation in any manner with, or otherwise endorsed by, Glock, Inc. or Glock Ges.m.b.H. The use of the word "GLOCK " on this page is merely to identify which firearm these parts or components are compatible with. Fits Gen. 5 Glocks (except 42, 43, Gen 5), Easily installed and removed with no permanent modifications. Great replacement for a plastic factory part. All designs are laser engraved. If you have any questions about this product by Fixxxer, contact us by completing and submitting the form below. If you are looking for a specif part number, please include it with your message.